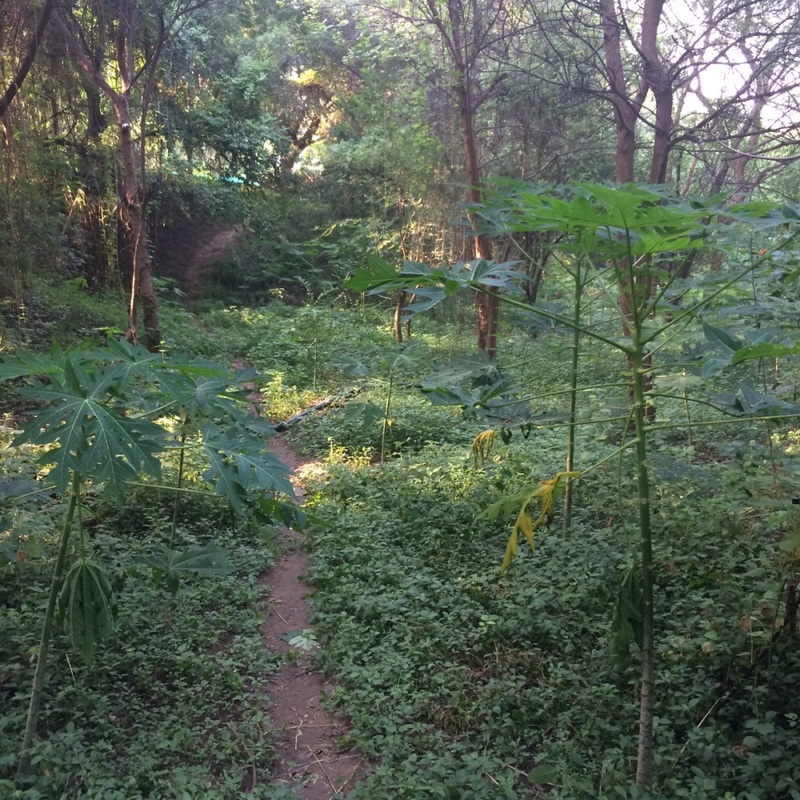 Vanya – Patanjali Jha’s ‘Eureka Food Forest’ in Madhya Pradesh. It took us 2 hours to drive 100 kilometers south of Indore to Vanya Organic Farms near Khal Bujurg, on the banks of the Narmada. The last few kilometers to Vanya is through a nondescript and scraggly village located on a kutcha dirt road, through semi-degraded and rocky land, then through a stream to reach what looks like a tropical forest. 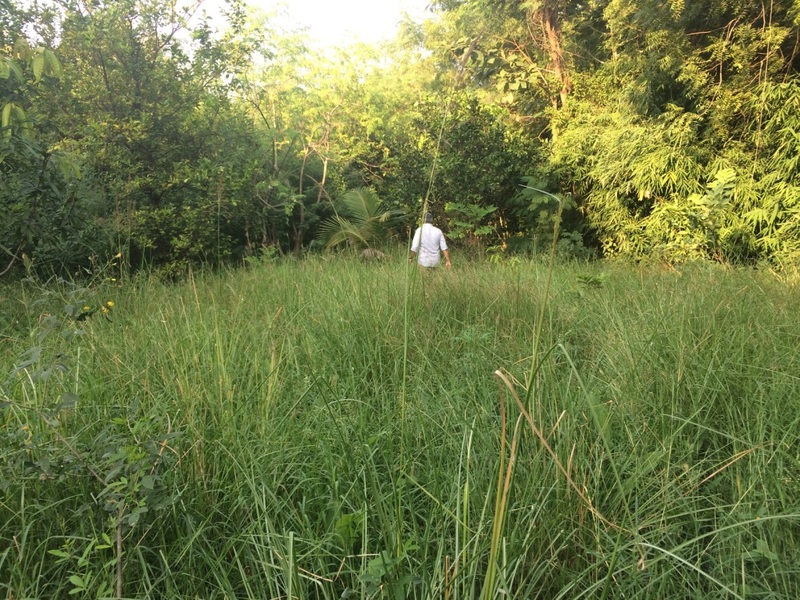 Once inside, you are overwhelmed by the sounds and sights of a true forest – the man responsible for establishing this 40 acre man-made forest is Patanjali Jha, my energetic host. He calls this his ‘eureka food forest’. 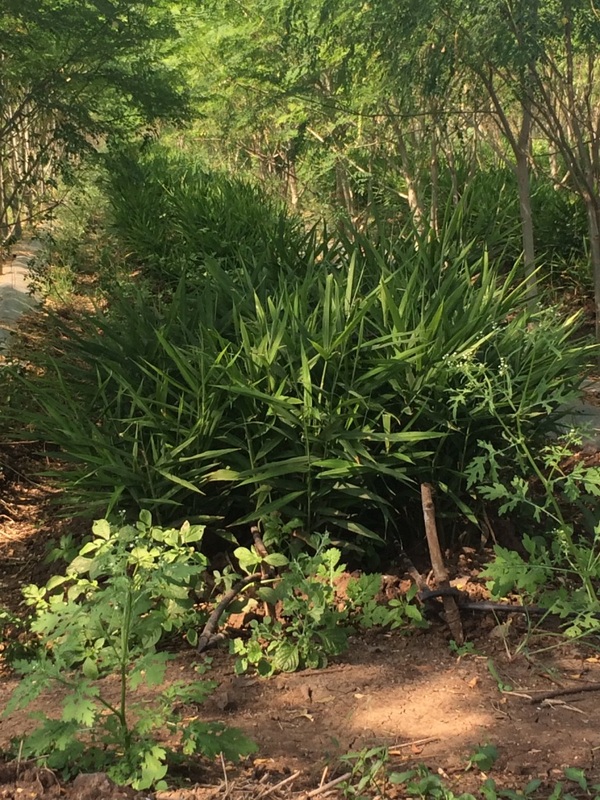 An area being planted – the land is sparsely forested before Patanjali works his wonders. We walked through parts of the dense forest over the two days. Tens of thousands of trees, heights varying from over 50 majestic feet to 15 feet, and lower in a new definition of ‘multi story’ – a huge biodiversity of hundreds of varieties : 400 mango trees, 5,000 drumstick, 5,000 citrus (rangpur lime, mausambi, kaffir line, grapefruit, kagzi lemon), 7,000 papaya, 5,000 Subabool, 500 Neem, and thousands more of perennial Arhar, Amla, Amrood, Kathal, Ber, Pink Pepper, Jamun, Banana, Babool, Glyricidea, Teak, Phalsa, Sharifa, Bel, Wisdom Tree, Swarn Champa, Khajoor and Coconut; and finally the understory of thousands of plants of Ginger, Turmeric, Aloe Vera and millions of slips of Khas grass (Vetiver). What a feast for the eyes. Vanya is visibly a labour of love and intense, single-minded effort over the 12 years since his parents bought the first ten acres; to which his partners have added land for him to manage with his green fingers. Patanjali credits the Japanese no-till farming visionary Masanobu Fukuoka and the Gujarati natural farming pioneer Bhaskar Save for inspiration, though Patanjali’s implementation of this vision is clearly his own creation. Vanya’s main produce – alas, we are all bound to the revenue cycle – is citrus, papaya and turmeric. ; with plans to add pink pepper. 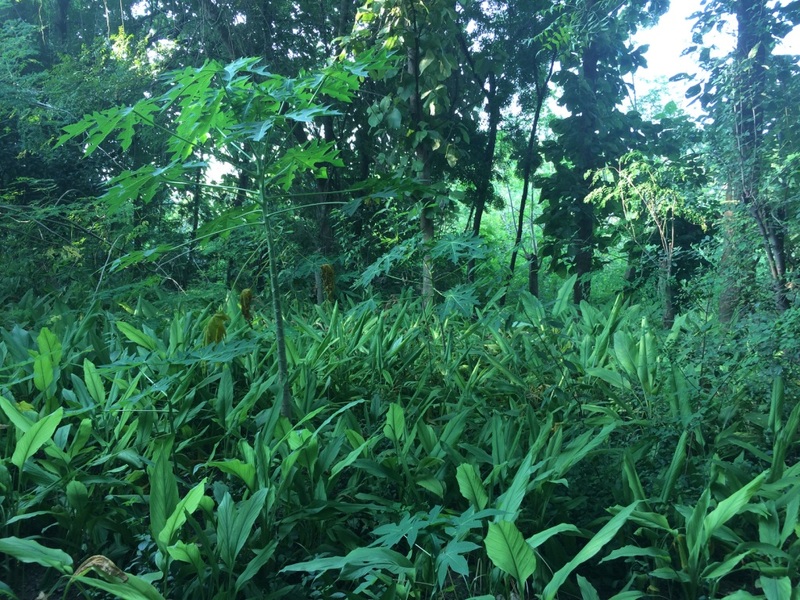 Of the total 40 acres, planting of the bio-diverse food forest continues apace on 20, while the rest is already well forested. Over two days, Patanjali and I jointly investigated the principles that underlie our implementations of ‘natural farming’. While we follow the same principles of mimicking nature, primarily studying the self-sufficient forest, our tree and crop growth is made different by our vastly differing ecology, geography and climate i.e. the tropical climate and sandy loam soil of Vanya next to the perennial Narmada river; and the semi-arid sandy soil of Aman Bagh in the rocky Aravali mountain range. We both grow a wide biodiversity of locally adapted plant and tree life, including many nitrogen fixing trees, with a preponderance of perennially fruiting trees and shrubs. Vanya implements zero tilling as they do not grow cereals, while Aman Bagh tills actively for growing multiple cereals, lentils and oil – though increasingly with reduced intensity as we release land from annual crops to perennials : what is common is the wide poly-culture approach to cropping. Then, we both have multiple layers of biomass (the leaf and branch detritus of our trees, chopped or just dropped) deposited on the soil in layers one on top of the other for years (decades, in the case of Vanya) as mulch that creates the topsoil. Aman Bagh commenced adding cattle dung as the initial biomass and fertiliser as we had so few trees in 2011, only now are we in a position to prune trees and add their residue. 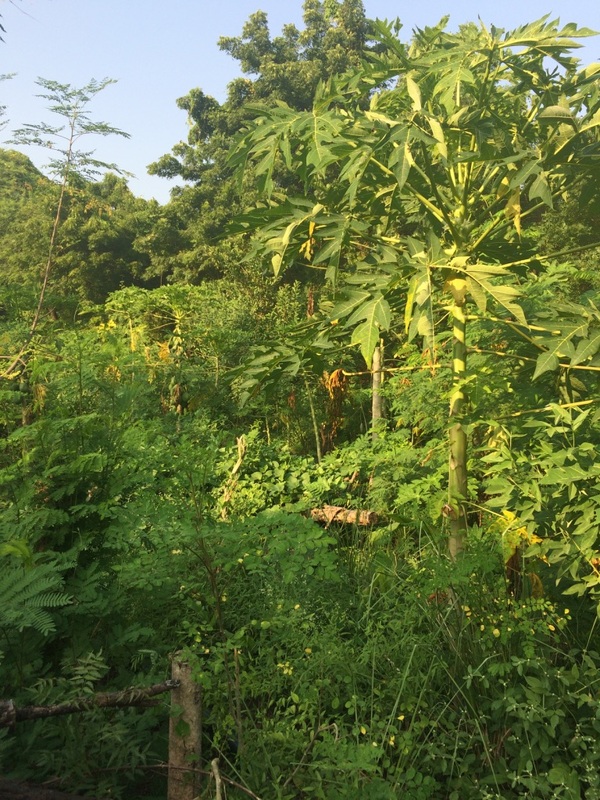 7,000 Papaya plants abound, with 5,000 more being planted in random all over Vanya’s 40 acres. 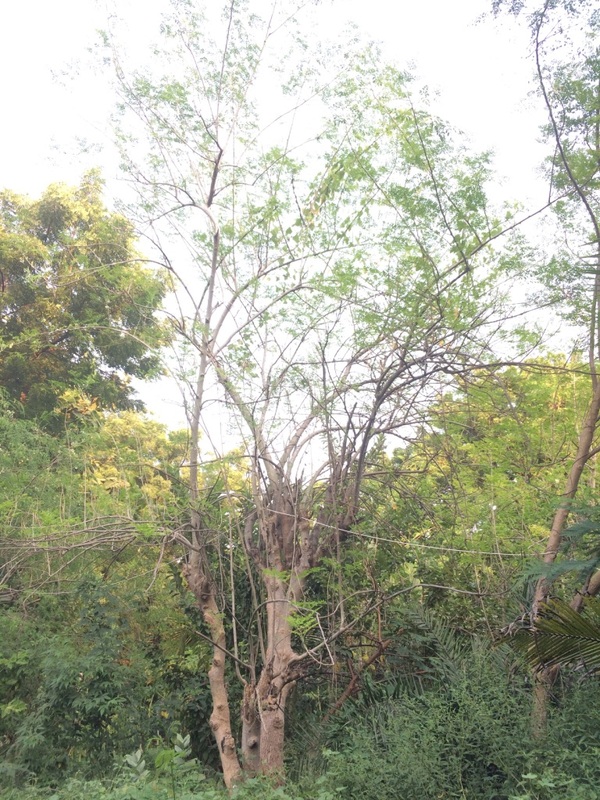 The perennials trees and plants are grown in multiple ‘layers’, and are carefully selected locally adapted or ‘desi’ (local) species some with leaves (Moringa or Drumstick, for example) small enough to allow sunlight to filter through to the lower layers. This bio-diverse tree growth forms the biomass that enriches the soil and feeds the thousands of kinds of microorganisms and animal life (a world of bacteria, fungi, Protozoa, nematodes and larger animals and birds as well) that thrive on decaying plant matter. The sunlight that does reach through the trees in the sky and the mulch on the soil has lost the harshness that could destroy the living organisms feeding on the mulch from trees. And, obviously and necessarily, the most important exclusion is that of man-made chemicals of any kind from the farm ecosystem. 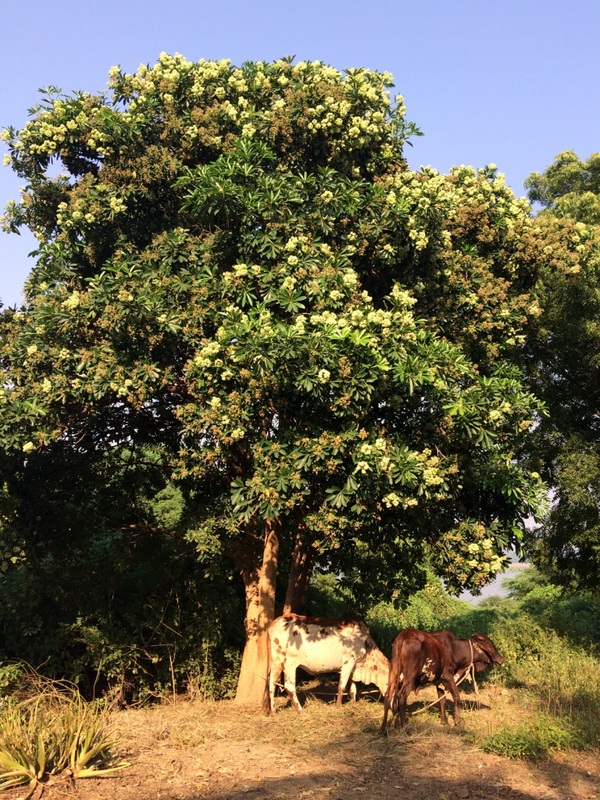 Vanya does not use cattle manure, as their vast quantities of varied biomass from the trees are sufficient food for the soil, while Aman Bagh actively uses cattle dung as fodder as our drier climate and depleted soil needs all the organic matter it can get. Neither does Vanya use any organic or natural pest repellant sprays recently made popular as he believes healthy soil creates healthy plant life – and if there are insects that eat some fruits or leaves, let them too live. I couldn’t agree more. These creatures are pests for man, not for nature. Extensive ground mulch at Vanya over 12 years has made the soil soft, water absorbent, and bountiful. Patanjali has an infectious enthusiasm, specially when he talks about planting food forests in 10,000 acres in the coming years. While the principles of what he calls ‘eureka farming’ are clear, what provides him the confidence to dream big are his visible implementation successes. He also feels – and I love this big hearted approach – that as long as core principles are followed one must plant with abandon, without too much science and too much design. I could see this attitude in his directions to the Vanya staff on planting 5,000 papaya sapling in the coming few months. 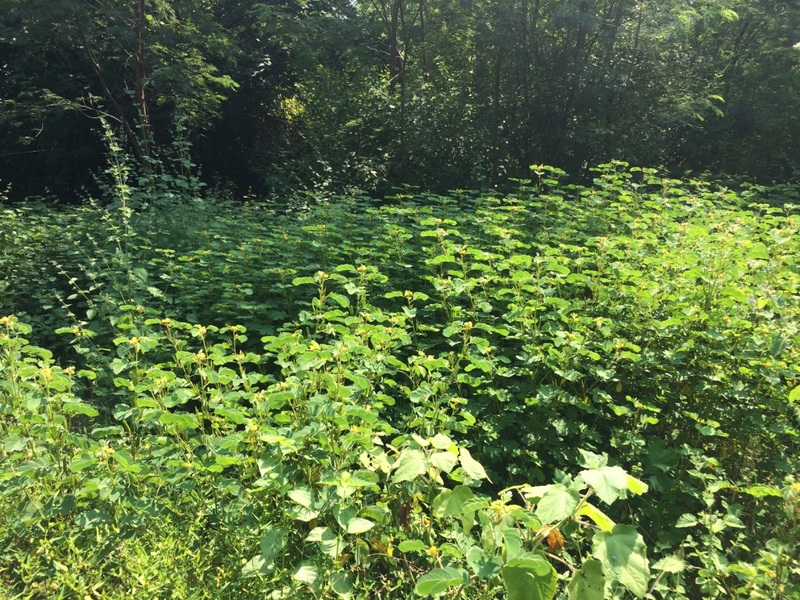 Once these are established (in the 1 year after planting) in between the existing trees, his people will leave it to nature to grow them, making them maintenance free. 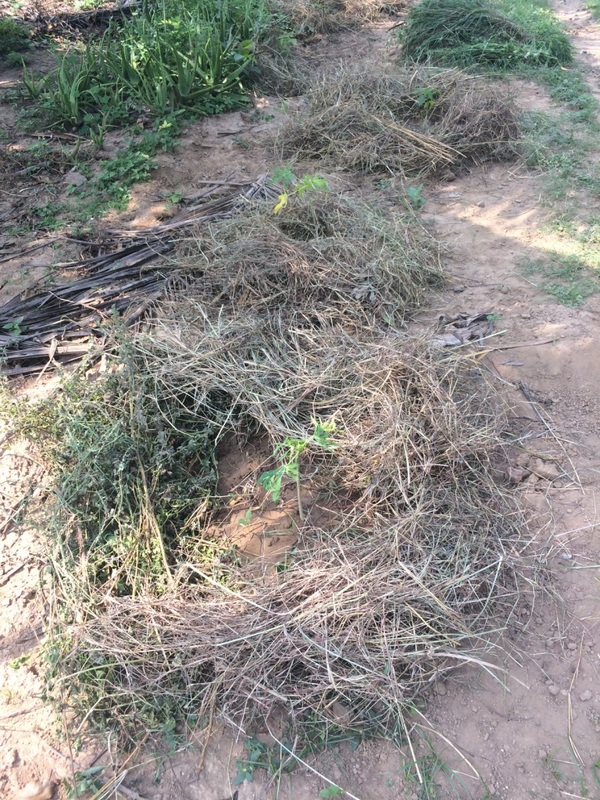 Thanks to generous Patanjali I carried back gifts from Vanya to Aman Bagh – a few hundred slips (saplings) of Khas (Vetiver) grass and thousands of seeds of open pollinated Moringa, yellow papaya, sharifa (custard apple) and grapefruit; as well as local turmeric. His spirit of sharing makes a bygone era come alive when seed commerce did not exist, and neighbours exchanged saved ‘open pollinated’ seed varieties freely. He rekindles hope in collaborative farming and in ‘co-creating’ a future of plenty, as more of us natural farming practitioners learn from each other and from the ways of the forests and that of nature. Vanya, on the banks of the Narmada. The inspiring Ernst Gotsch, a Swiss farmer settled in Brazil, and his unique Agroforestry approach to food forests and Entropic farming, with many things to learn for organic, permaculture or natural farmers. “Open areas have no future, it’s going backwards. Areas without trees don’t generate resources, they drain resources.” Ernst Gotsch. Gotsch’s Principle #1. Mimic the structure and functioning of the natural ecosystem of the place (that you farm in). Choose tree and plant species that fit in. Imitate nature, and the natural succession of species as it takes place in the forest. Gotsch’s Principle #2. Create a system that produces its own fertiliser. (Grow locally adapted trees, and prune them heavily for fertiliser for the soil). “We are part of an intelligent system, we not the only intelligent ones … and if we would accept that it would be completely different because from all the other species we could look and see what they do and understand the profound truth and knowledge they impart” Ernst Gotsch. “Our soil teems with a multitude of organisms which provide the necessary environment for healthy plants to grow free from disease, pests and infertility. These interconnected interactions and feeding relationships (quite literally “who eats who”) help determine the types of nutrients present in soil, its depth and pH, and even the types of plants that can grow”. Elaine Ingham, Innovative Farmers Conference, USA. 2016. Quote | This entry was posted in A Day in The Life and tagged food forest, natural farming, organic farming practices, permaculture. Bookmark the permalink. Let us follow the shared dream of raising more food forests, establishing regenerative farms all across the country and the world. Our country having so much of sunlight, arable land , young population and rains this form of agroforestry can utilize these resources to the hilt and generate enormous amount of good soil and bountiful produce alongwih reversing the global warming. It was wonderful to host you on our farm and I find the above narration very moving. 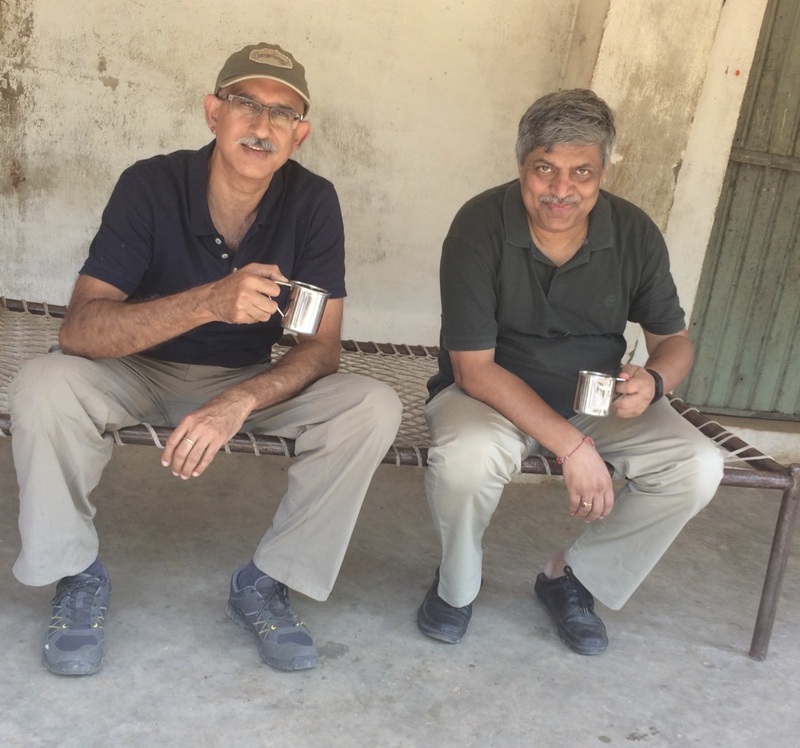 What an incredibly enriching experience it must have been to to visit Mr. Jha’s farm – proof yet again that agroforestry as a practice can (and must) be incorporated into modern farming and still flow along with the “revenue cycle” as you so aptly put it. Looking forward to see the little saplings you take back to aman bagh sprouting by the time I visit next this winter. Thank you for sharing this. See you soon, Arjun ! As always, very informative and useful. Any calculations/rough estminates regarding how much time does it take to be self-sufficiently dependent on it? 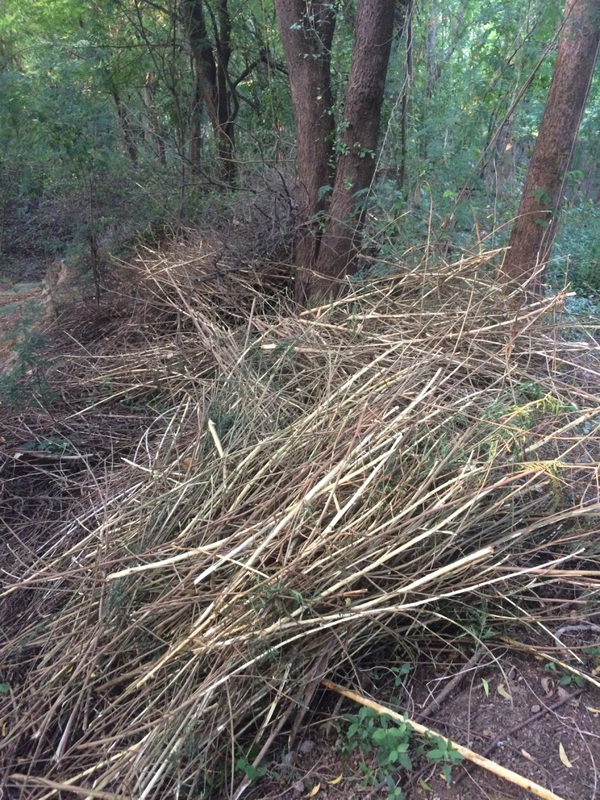 And what would be minimum scale for such food-forest ? Hats off Mr. Patanjali, there are people still present , so much nature loving and dedicated to mother Nature. Well written and very informative . Thanks Harsh for sharing it. Thanks for sharing this Harsh. Truly inspiring. Patanjali’s journey, experience and success stokes aspiration. Great work Patanjali. Learnt a lot. Wonderful post! I learnt so much from it, and look forward to learning much more from your blog, Aman Bagh! It was indeed encouraging to learn about Mr Patanjali”s enterprise.Good luck in your MISSION .Appreciate if You share Marketing Issues of products of vanya food. Very informative and essential read. Soil is our source and destination. We need to adopt regenerative agriculture and circular economies for survival and thriving of our planet.